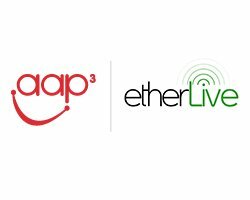 Etherlive, one of the UK’s leading providers of IT and communications technology for the live event sector has formed a strategic partnership with global IT services and recruitment company, aap³. The strategic partnership, which includes aap³ becoming an investor in Etherlive, will see both companies maintaining their individual brands, businesses and operational management structure, with Etherlive continuing to be led by Chris Green and Tom McInerney, and aap³ by Rod Jackson. As a result of the partnership the global footprint of each organisation has substantially increased, with a collective UK presence in Southampton, London, Glasgow and Brinkworth, Wiltshire – the latter soon to be relocating to a new, larger facility in Royal Wootton Bassett which will provide facilities to both Etherlive and aap³. This is alongside aap³’s existing US offices in North Carolina and California, with a third US office due to open later this year in Dallas, each of which will provide a springboard for Etherlive’s entrance into the US market. The strategic partnership produces a combined turnover of over £32m ($50m) with over 650 staff worldwide, and will provide each business with access to a broader range of technical services and resources, engineering expertise and knowledge; with the wireless capabilities and expertise of both companies complimenting each other. This footprint, combined with aap³’s strategic hubs of engineers and contractors spread across the US and EMEA, will provide both businesses with a huge pool of talent and resources, and enable both companies to provide additional services to their customers. Moving forward, both companies will be working together on new technical solutions that will appeal to their respective customer bases, whilst further developing opportunities within their individual vertical markets. Etherlive partners to provide services for events such as G8 Summit, T in the Park, Green Man Festival, Goodwood Festival of Speed, Southampton Boat Show, London World Triathlon, Nokia, Amazon and Sony.